I got to the NOVAG Game Day late because of some soccer obligations I had with Garrett. I was given a day pass by my swimbo which I took full advantage of. Most of the NOVAG election stuff had been accomplished by the time I got there, but I time to get into the afternoon segment. Fortunately, my friends Rich Low and Andy Turlington were there, and they were game for some boisterous Ironclads action. 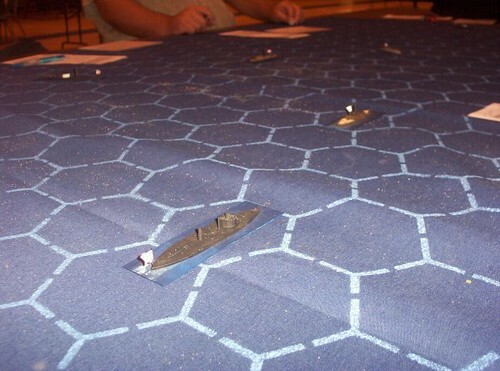 Ironclads, if you are ignorant of that excellent and venerable game, is a game of combat of American Civil War naval craft. 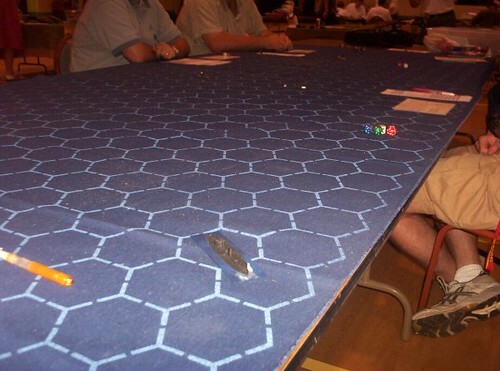 The game itself was designed back in the YAQUINTO days, and has since been reprinted once (with heretical side-view counters) by EXCALIBRE games. 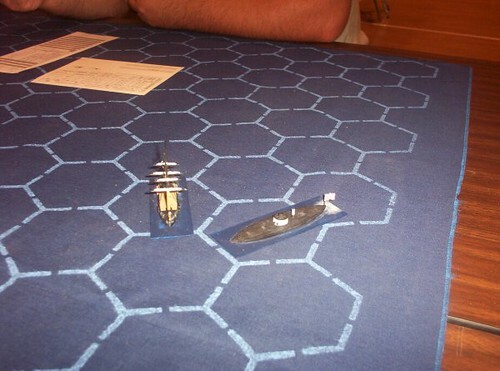 The game as published was a boardgame, with top down chits representing ships. 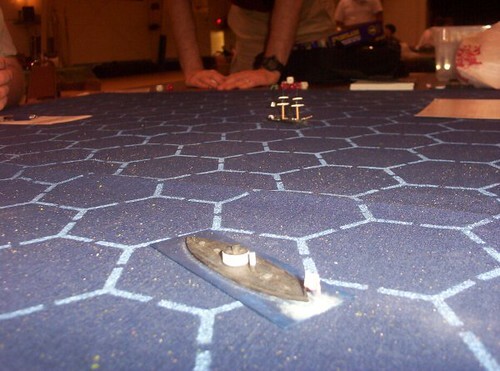 Miniatures players realized quickly that Ironclads could be played with Miniature ships, if you had a hex map it was easy, but you can easily extrapolate hexes to inches if you didn’t. I love this particular historical subject area, personally, and I have played IRONCLADS before and am usually up for a game! 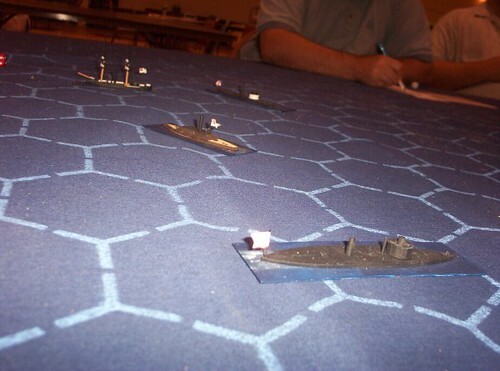 Andy has a giant hex map he had made for him, and Rich has a bunch of exquisitely painted 1/600th scale ironclads he bought off of THOROUGHBRED MINIATURES run by Toby Barrett. Toby’s ships are real beauties to behold, with loads of detail. We resolved to have a free form battle, just playing until you sank or were captured, and jumping back in when your valiant ship went to Davey Jones’ locker. 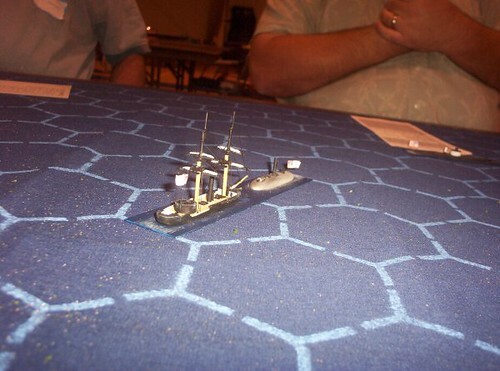 I started with the CANONICUS (I think) steaming ahed from one side of the table and Andy took the CSS STONEWALL JACKSON arriving from the other. Two other players jumped in after we got started. Note, the only ship names I’m even roughly sure of are the STONEWALL and the MANASSASS. Single turret monitors pretty much all look the same to me. So names here are rough guesses from a faulty memory. The CANONICUS steams towards here destiny at speed 4. The STONEWALL can do a speed 7 and that can be kind of intimidating… but what the heck; he’s wood, I’m iron. We’ll see who sinks first! You can JUST make out the STONEWALL at the edge of this picture. 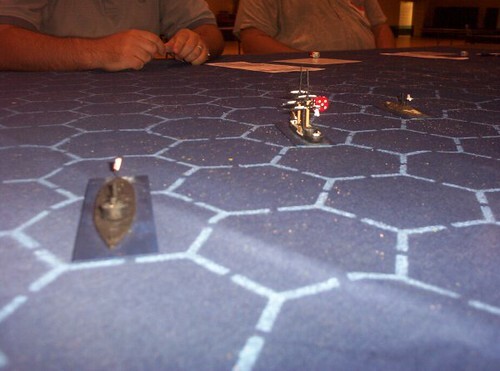 The CANONICUS tries a few ranging shots on the STONEWALL, just to refamiliarize myself with IRONCLADS which I haven’t played since the 80s. She does surprisingly well, giving the STONEWALL some flotation point hits and knocking out a couple of crew. 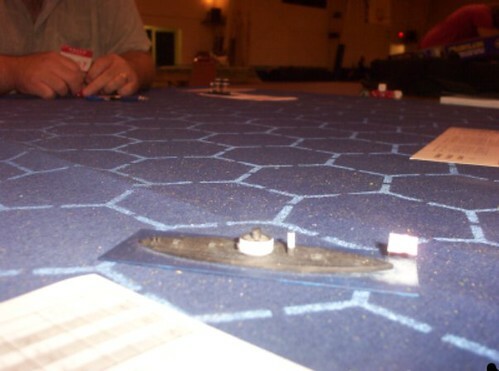 Note that in this position, I could shot at STONEWALL but she couldn’t fire back… I wasn’t in her gun arc. Later, I try to maneuver around the STONEWALL for a better shot. 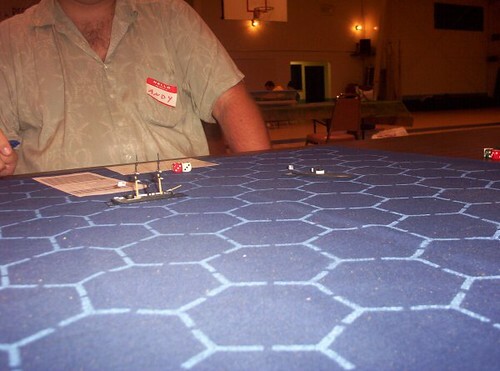 Bad idea when he can catch up to me in three hexes extra movement. 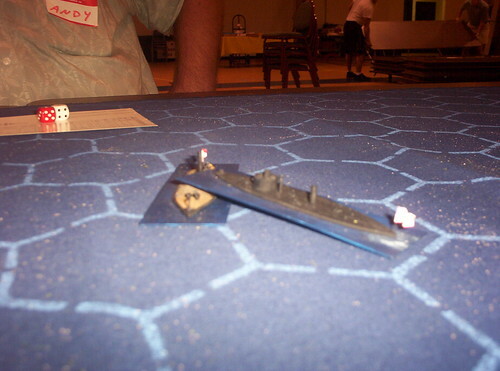 STONEWALL fires his main pivot gun on me but his gunners must be out of practice. On to the table steamed the PASSAIC (I think). Not quite as good as the CANONICUS but if he didn’t close with the STONEWALL, he’d be okay. At this point, the MANASSAS (CSS) also shows up, but she was not doomed to stay in the fight very long. She steamed in my general direction, taking some ranging shots from the rapidly advancing PASSAIC. I manage to get outside the STONEWALL’s cone of fire again, and let fire very close in, at a 3x impact strength point blank shot. 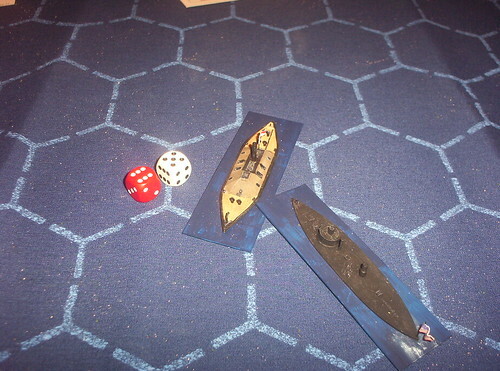 The MANNASSAS takes more punishing fire from the PASSAIC (and me) and I get a couple of hits from her as well, killing some crew and denting armor. Unfortunately for the MANNASSAS, both her and the STONEWALL were committed to a wide turning motion to bring their guns to bear, and the inevitable happened. The inadvertent ram was devastating to MANASSAS’ depleted crew, and the remaining three sailors jumped for it, leaving her a drifting hulk. HER replacement was the CSS TEXAS (I think). The TEXAS was a game bird, and chugged out to meet the CANONICUS and the PASSAIC. My ship had been taking some pretty hard pounding from the STONEWALL; so another set of guns trained on me wasn’t exactly a welcome diversion. CANONICUS was in the thick of things, and eventually the damage and casualties caught up with her. She managed to get in a uncontrollable fire situation, and her crew bails on her. Sniff, she was a noble ship, and a fighter!!! MY replacement monitor was (*I believe*) the MANHATTAN. Note on the pictures here: the camera did a weird job of numbering these. In some of them the MANHATTAN appears out of numerical sequence before I recall the CANONICUS going down (bear with me here– the narrative is reasonably accurate for my memory, and only a few pictures are out of sequence). Here, the MANHATTAN charges the TEXAS. Getting behind her, and destroying her rear firing guns. At that point, it was pound, pound, pound, pound, until the TEXAS had a magazine fire on board. She also has the crew bail on her. At this point, the PASSAIC (still hanging in there), the MANHATTAN, the rapidly disintegrating STONEWALL and the TEXAS are doing a complicated circular dance, trying to get the range and angle on her. TEXAS is about to be finished off. STONEWALL takes one too many crew hits; the MANHATTAN turns her into a “ghost ship” by killing off her entire compliment (Andy Turlington assures me this is the only way the STONEWALL has ever been killed off in his experience running her). In at the death. The PASSAIC takes some close in shots on the STONEWALL, sheltered by the angle. Alas, the PASSAIC would also succumb to damage and crew death, and she heals over and goes down as well. The PASSAIC put in a good effort, considering she was lightly armored and undergunned compared to the CANONICUS and the MANHATTAN. So it was the MANHATTAN versus the newest CSS casemate: the ARKANSAS. That Confederate Captain was a game chicken, having lost the MANNASSAS, the ! Having learned from my experience with the CANONICUS, it wouldnt’ do to cruise up close to ARKANSAS’ ship smashers. MANHATTAN had taken some damage doing in the TEXAS and STONEWALL, but was still very much intact. I resolved to swim around the ARKANSAS at a distance, moving as far as possible away and taking ranging shots. A monitor can take advantage of angles far better than any old casemate. 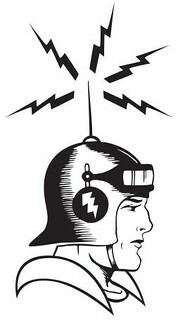 This wasn’t what I had in mind… but such is life in the world of iron plate and red hot shot. MANHATTAN didn’t have much of a chance, according to the charts. She did have a ram, and she was going full tilt (speed 7) when she struck. Miracle of miracles, I hit ARKANSAS in exactly the right spot to create a critical hit (magazine fire/explosion)! The ARK went up, nearly taking MANHATTAN with it (dice rolls added for emphasis). It being late in the day at this point, we resolved to call it a battle and shook hands all around, courteously thanking Rich and Andy for throwing the game. I had a hell of a time. 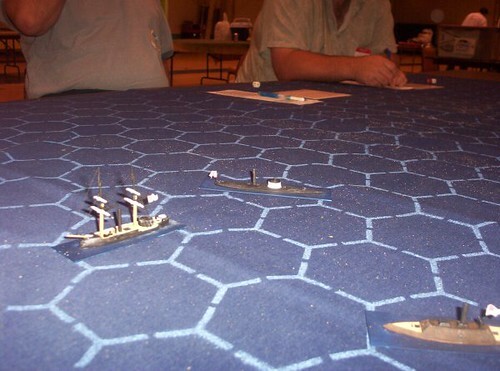 The thing about the Ironclad era is that very few of the historic battles featured a ton of ironclads on either side, so much of what we do with ACW naval is fantasy “what if” engagements, and that suits me just fine. Thanks fellers, let’s do it again sometime. Previous What would Jesus do?